For almost 300 years the Unicorn Clan have settled in Rokugan, yet still they retain much of the wildness and gaijin customs that set them apart from the other Great Clans. It�s not that they are unable to assimilate, but rather have learned in their travels to remain true to themselves. 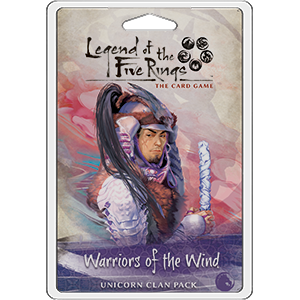 Warriors of the Wind celebrates all that makes the Unicorn great. Look for a Stronghold that rewards you for exploring your opponent�s lands, Meish?d? events that protect your characters from harm, and battle steeds for the Utaku cavalry!